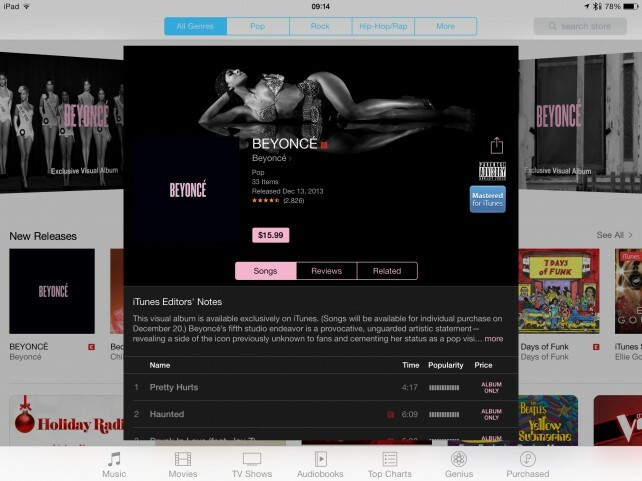 By going direct to iTunes, Beyonce cut a lot of people out of the pie. One of those entities is Target. They don't get to have the first week or so of sales from what might be the biggest album release of the year, and oh boy are they mad! Target has announced that they will not be carrying the new album at all. Message to artists, "If you don't come to us first, don't bother coming to us at all." Target desperately hopes to discourage any other artist from going the iTunes exclusive rout. The irony is that this exclusive will probably only be for the first week. Target, on the other hand, sells Target exclusives that are not released at other retail outlets. With the shoe on the other foot, Target is frightened. What happens to music sales at Target, Walmart, and Best Buy if all the big named artists take the iTunes exclusive rout? Target does not want to know, and will not sit still waiting to find out. I expect a similar reaction from another major retailer. I also expect more iTunes exclusive albums in the coming months. I love watching the music industry implode.